This NAS (non-aged statement) bottle of Longrow first came out in 2012 and there are now 13 different versions of it listed on Whiskybase. My 20cl came as part of a Springbank distillery set of three 20cl bottles, which also included the Hazelburn 12yo and Springbank 10yo. I already have a similar set that Springbank did of their ‘CV’ range. A 20cl bottle is a nice size to give you a proper taste of a whisky whilst keeping the cost down and not outstaying its welcome. 82/100 on Whiskybase for this peated Springbank is a reasonable score but the main 70cl version scores nearly 84/100. It’s effectively the same stuff and it’s in the range of ‘very good’ in terms of Whiskybase ranking. The CV, also NAS, seems to be a step up with a score of 85.5/100 but the path ultimately leads to the Longrow 18yo, which scores 88.5/100. I have a 20cl bottle of the previous 2009 version of the Benromach 10yo, which is the one mentioned in the Whisky Bible 2016 scoring 87.5/100. This new Benromach 10yo came out in 2014 but it’s yet to be reviewed by Jim Murray for his bible. When Ralfy did a video for the 2009 edition he scored it 85/100. An excellent mark indeed but he gives this latest version 89/100 and the honour of his ‘Whisky of the Year 2014’. For the price and quality it’s a tough one to beat in Ralfy’s opinion. In the Whisky Bible 2016 the author, Jim Murray, gives the 2006 edition of ‘Peat Smoke’ 90.5/100, which is two points ahead of what he thinks of my 2005 bottling. But the good folk of Whiskybase give the 2006 version 82.6/100 (from 50 member votes), which is 0.1 behind the 2005. So make of that what you will, which is probably nothing since there really isn’t anything in it. This version of ‘Peat Smoke’ has a 67ppm rating, which is ‘parts per million’ relating to the phenol level, not ‘pancakes per minute’ like I first thought. The 2006 edition is 62ppm so a slight step down in terms of peatiness but I doubt anyone will notice. My phenol receptors aren’t that finely tuned. Jim Murray says of the 2006 bottling “a more measured malt than the previous vintage” but that’s very much his opinion. It’s a relief to know that no cows, chickens or sheep were harmed in the making of this whisky. Admittedly there’s a lot more to ‘organic’ than making sure animals haven’t been battery farmed but do whisky drinkers really care if the grain never got sprayed by chemicals and the casks were made from oak trees that received daily hugs? It’s unlikely. Benromach ‘Organic’ was the first whisky to be certified as organic back in 2000, when the concept of being organic was the ‘in thing’. The whole process had to be checked and confirmed before any spirit was made. The first bottling came out in 2006. 82.5/100 on Whiskybase, although not as impressive as 95/100, is nevertheless a very good score from nearly 200 member votes. Comments include “it’s delicate indeed, as the label suggests. A light bodied dram.” And “I like it. It is a bit youngish, but definitely has character.” But some feel the quality has been diminishing in recently year. Jim Murray’s review dates back to 2009/10 and underlying whiskies change over time even if their labels and details don’t. I just hope I’ve not left it too late and most of the qualities of this brilliant 10yo are still in the bottle. No, this is only a 20cl rather than 70cl of this rare Port Ellen. Nevertheless it’s one of the most expensive whiskies in my collection. I felt I had to get an example from this legendary distillery before even a miniature cost the same price as a Manchester United season ticket (and just as hard to acquire!). At the time of writing this you’d do well to buy a 5cl of Port Ellen at auction for under £50. Even if you acquire one, will you be able to bring yourself to drink it at the price you paid? I had to go back to the Whisky Bible 2008 to find Jim Murray’s review for this Port Ellen as release 6 came out in 2006. 94/100 classifies this dram as a “superstar whisky that gives us all a reason to live”. Hardly surprising for a distillery closed in 1983, which is now considered the connoisseur’s choice. So intimidated am I by this whisky that I wouldn’t dream of drinking any unless I felt my taste buds were finely tuned and having an exceptionally good day. Otherwise I’d feel I was wasting it. I can only find 8 of the 14 releases likely to be covered by the Whisky Bibles in my possession and Jim Murray only scores the 4th release higher than the 6th with a score of 95/100. For my bottle he says of the taste “sweet delivery: the peat alternates with the soft Demerara for custody of the middle ground; spices abound” and summarises with “a luxurious malt and worth an hour of anybody’s valuable time.” Don’t worry Jim I have no intension of slugging it back with a dash of coke and a few ice cubes! The Malt Maniacs (a group of very experienced whisky drinkers) provide ratings for the first 12 releases. 90/100 is slightly above average but equal with releases 2, 5, 7 and 12. Only 3 releases score higher – 11th (91/100), 9th (92/100) and 10th (93/100). On Whiskybase, 92/100 is very much the par score across all the releases but the 10th, 11th and 12th releases go up to 93/100. These are older whiskies, over 30 years, and in the video below by Donald Renwick (distillery manager at Royal Lochnagar) he mentions how well Port Ellen matures. He knew people who worked at the distillery and back then the spirit they produced wasn’t highly regarded. It’s sad that the world only found out how good old single malt from Port Ellen could be 20+ years after it closed. Bring the distillery back! And make it cheaper! When I started collecting whisky back in 2013 I was all set to buy Tomintoul’s ‘With a Peaty Tang’ until I had a bad experience with the Ardbeg 10yo. I first tried the Ardbeg back in 2000 and I loved it but it now tasted far more medicinal in flavour than I remembered. I decided that peat should be put on the back burner, and I’d keep my Speyside malts as traditional as possible. I bought the Tomintoul 16yo for the collection and left it at that. 2 years later and I’m a complete convert to the peat experience. The Ardbeg 10yo is one of my favourite drams, which reignited my interest in the ‘Peaty Tang’. Although its score of 80/100 on Whiskybase is quite average, 94/100 in the Whisky Bible classifies it as a “superstar whisky that gives us all a reason to live”. At around £26, it’s good value for the quality that it delivers. Jim Murray, the bible author, says “a bit more than a tang, believe me! Faultlessly clean distillate that revels in its unaccustomed peaty role”. Having really enjoyed the Glendronach ‘Revival’, which I tasted in 2014, I was browsing on the ‘The Whisky Shop’ website when another Glendronach caught my eye. It was a cask strength, limited release of a 2003 11yo. Unfortunately it had sold out. Damn! But it was £60, so quite expensive. A few days later I got an email from Whisky Galore (also known as ‘The Green Welly Stop’), which mentioned their 50th Anniversary. To celebrate this milestone, they had a special bottling of Glendronach, 2003, 11yo. It was practically identical to the bottle on ‘The Whisky Shop’ with a similar limited release (649 bottles) and cask strength. But it was under £50 and came with a commemorative engraved Glencairn glass! A bargain I couldn’t resist. Scoring 88.75/100 on Whiskybase is a fantastic score, especially when you consider that the legendary 15yo ‘Revival’ scores a point less. But saying that the standard 12yo ‘Matured in Sherry Casks’ scores a healthy 88.34/100. Looking at the whole Glendronach range from the distillery on Whiskybase clearly shows that scoring around 90/100 is very typical. The distillery clearly has its fans and my Whisky Galore example is a good one. Scoring over 87/100 on Whiskybase, 95/100 in the Whisky Bible, and 91/100 from Ralfy, I don’t know whether to drink this whisky or worship it. Michael McIntyre would have us believe that when we look at something on Amazon we always want to read the 1 star “it slapped my wife” reviews. Of the 5 reviews on Amazon for the Old Pulteney 17yo, four give it 5/5 and one gives it 4/5 with the comment “wonderful”. Try as I might, I can’t find a bad word said against this whisky. And believe me, I’ve tried! So, it comes as no surprise that I’ve been after this whisky for a while. I first spotted it in the book ‘101 Whiskies to Try Before You Die’ by Ian Buxton. He includes the 17yo instead of the 21yo because he considers the latter “just a trifle over-aged”. 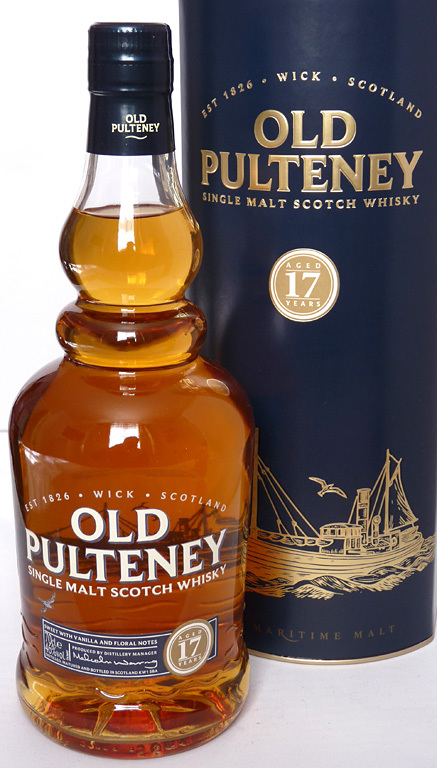 He feels the 17yo offers the best combination of taste, maturity and value in the Old Pulteney range.